I'll be the first to admit that when a Western release of Fate/Extella: The Umbral Star was first announced, I couldn't help but be a little excited. Type-Moon's Fate universe is something that I hold a high level of adoration for, and I do enjoy picking up a Musou-like game and tearing my way through endless hordes of faceless enemy soldiers every now and again. With that said, one of the most recent games I've played in this genre was the 3DS port of Hyrule Warriors, which managed to draw me in for many, many hours. In fact, both my Wii U and 3DS copies of Hyrule Warriors still get a lot of use to this day, and I often find myself once again succumbing to its addictive and cathartic gameplay. Would Fate/Extella manage to draw me in just as much as Tecmo Koei and Nintendo's collaboration did? Sadly, the answer to this question is both "yes" and "no." In a similar fashion to other Musou-like games, the combat of Fate/Extella is simple, but fast-paced and satisfying. You have access to both light and heavy attacks, which can be chained together to defeat multitudes of enemies. This is to say that most battles will leave you with a kill count of well over 4,000. In addition to your standard attacks, you can also block and dodge enemies. 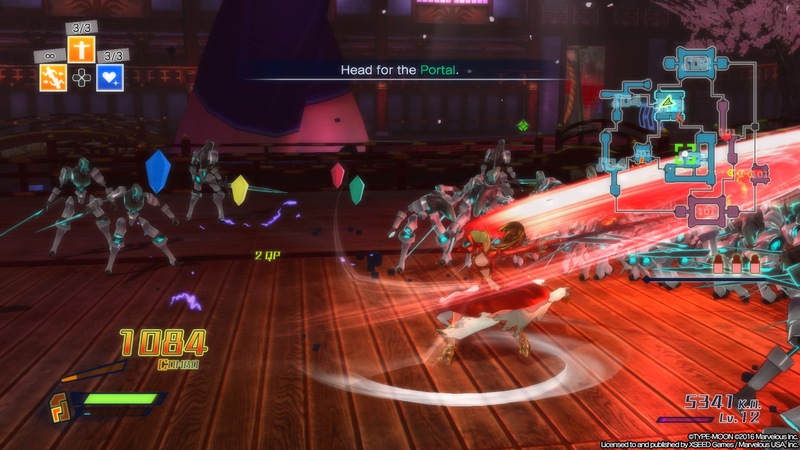 The latter lets you pick up many of your foes so you can round them up, in order to take them all down with a well-timed 'Extella Maneuver,' dealing heavy damage to anything and everything within a nearby vicinity. Battles usually take place in one of five arenas (with some notable exceptions), and the primary goal of each match is the acquisition of fifteen 'Regime Keys' in order to complete a 'Regime Matrix.' Essentially, this boils down to capturing enemy keeps (or 'Sectors,' as the game refers to them) while also defending your own territories. Each Sector has a numerical value attached to it, which refers to how many Regime Keys are obtained through its capture. Losing a territory will also deplete your own supply of Regime Keys while bolstering your opponent's. Once you have fifteen of these Keys in your possession, the stage's Boss Servant will appear on the battlefield. Defeat the Boss Servant, and you'll emerge victorious from the battle. 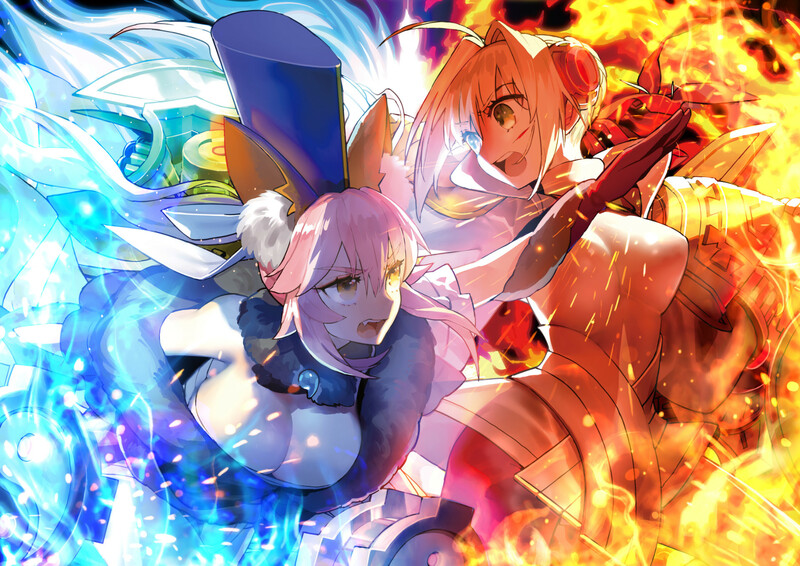 While the core gameplay loop of Fate/Extella doesn't break any new ground, it is pretty damn addictive, to such an extent that I often found myself procrastinating for hours on end by playing a few Free Battles even when I was writing this very review. For this reason, I can see Fate/Extella staying on my PlayStation 4's hard drive for a long time to come. Unfortunately, Fate/Extella has plenty of issues, many of which are related to the game's sheer lack of variety in terms of content. As I've previously mentioned, much of your time will be spent battling in one of five separate arenas, all of which are introduced within the first of four separate plot arcs. Admittedly, there are a small number of additional boss arenas to go alongside this, but the better part of your the game's runtime will be spent in the aforementioned five main locations. 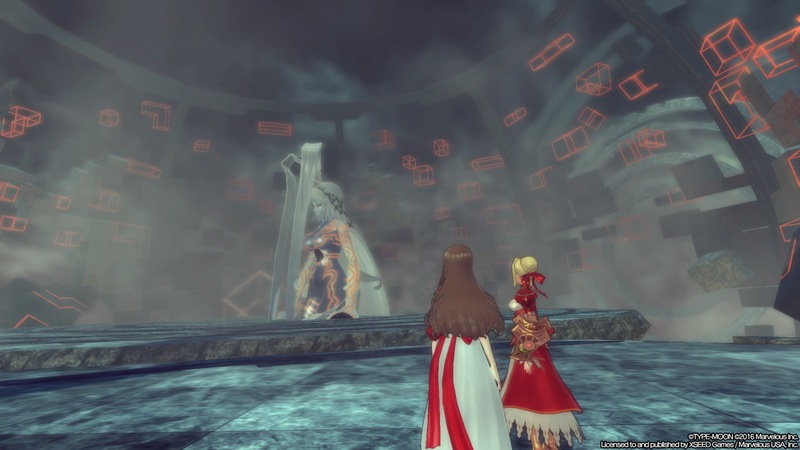 By the time you reach the second story arc, you'll realise that you've already seen most of what Fate/Extella has to offer, as you'll find yourself fighting your way through these same five environments yet again. Then you get to the game's Side Stories. As you work your way through Fate/Extella's story mode, you'll unlock additional Servants to play as in the game's Free Mode, with all but one of these characters being obtainable simply by progressing through the game. When you unlock a character, you'll also gain the ability to play through a Side Story that's associated with them. 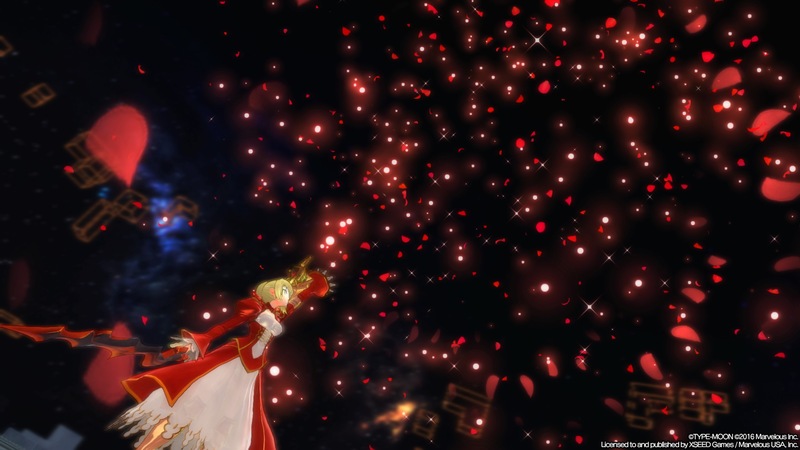 These short campaigns consist of three missions, and provide brief moments of respite from Fate/Extella's main storyline. While I did find some of these Side Stories to be particularly entertaining in terms of writing -- especially the ones relating to Lu Bu and Elizabeth Bathory -- they still fall into many of the same traps that tarnish the rest of this game's experience. That is to say, they're repetitious as hell. This becomes even more apparent if you happen to play each Side Story one after the other. I began to notice that -- not only do they mostly reuse the same handful of environments that I've already seen in the main game -- they even recycle missions from both the campaign and other Side Stories. You'll wind up facing up against the same objectives that occur within the same Sectors and in the same environments. By the time I was done with the game's Side Stories, I couldn't help but feel a little fatigued by the ordeal. Something that's just as egregious is that while Fate/Extella does contain two larger and more unique boss battles, one of these encounters is repeated three times throughout the main story. Admittedly, the second major boss encounter does have some rather interesting moments, but by the time I got a chance to face off against it, I was at the point where I was outright begging for a change of pace. I was just overjoyed to see something different. From a technical perspective, Fate/Extella's visuals aren't all that impressive, although this could partially be chalked down to it also having to run on the PS Vita. Of course, there is an upside to this; throughout my dozens of hours of play time with Fate/Extella, I almost never ran into noticeable stutters or drops in the framerate. However, this does come with the caveat that I was only able to test this game out on a PS4 Pro. Thankfully, raw graphical fidelity isn't everything. Thanks to its interesting art-style, Fate/Extella often looks surprisingly pretty in-action. While a couple of the environments don't look particularly great, there are some real standouts such as the 'Capital of Roses,' the 'Capital of Lust,' and the 'Stormy Sea Palace' arenas. Then there's the Noble Phantasm attacks, which look wonderfully ridiculous and over-the-top in action. 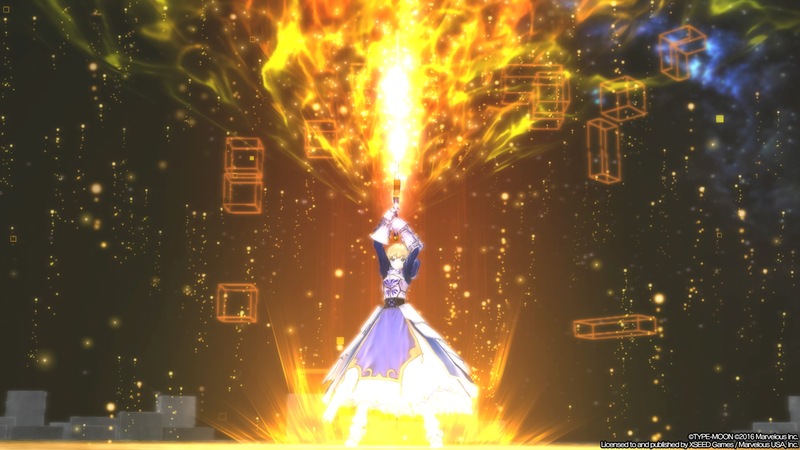 Whenever you trigger one of these abilities (which you can only perform once per battle), a short cutscene plays that does a great job of conveying the sheer devastation of your Servant's attack while also managing to be delightfully stylish from an aesthetic standpoint. Suffice it to say, I almost never skipped through these cutscenes whenever they occurred. When you're not slaughtering thousands upon thousands of faceless enemy soldiers or fighting against other Servants, the rest of your time in Fate/Extella will be spent communicating with the game's fairly diverse roster of characters. As far as the game's main campaign is concerned, it's just as much a Visual Novel as it is a Musou-like title. One thing that I did find commendable was that every line of dialogue in Fate/Extella -- save for those of the player-named protagonist -- is fully voiced, with many returning actors from previous Fate properties reprising their roles. The game's writing and characterisation are some of its strongest elements. The dialogue is serious when it needs to be, but is more often than not lighthearted and funny. Its characters are rather likeable, although it helps that many of their personalities have already been established by various other Fate properties. This is to say that while newcomers to the franchise may possibly be able to derive some enjoyment from these characters, they may wind up heavily questioning some of the more interesting design choices associated with them. As a prime example, Elizabeth Bathory is depicted as a Pop idol who is part-dragon. Fate/Extella also contains a 'Bond' system. As you complete various objectives throughout many of the missions -- or whenever you give a correct answer to a Servant's questions when you're talking to them -- you'll notice their Bond rank increase. As this rank increases, you'll unlock additional slots that you can equip items to in order to provide various passive boosts to the Servant's abilities. Another bonus to increasing your connection with a Servant is that you may trigger a unique cutscene or bit of dialogue. On a somewhat related note; yes, Fate/Extella does contain a fair amount of fanservice. This becomes especially noticeable once you unlock a particular variant of one of the game's playable Servants near the end of the fourth plot arc. While I won't give too much away, I will admit that its design is completely garish and ridiculous to such an extent that I couldn't help but find myself to be a little fond of it. Fate/Extella: The Umbral Star is not a bad game. In fact, it has a lot of good things going for it. Its combat system is fun and cathartic, the dialogue and characters are consistently witty and amusing, and its environments -- while not impressive from a raw technical standpoint -- manage to still be aesthetically pleasing. 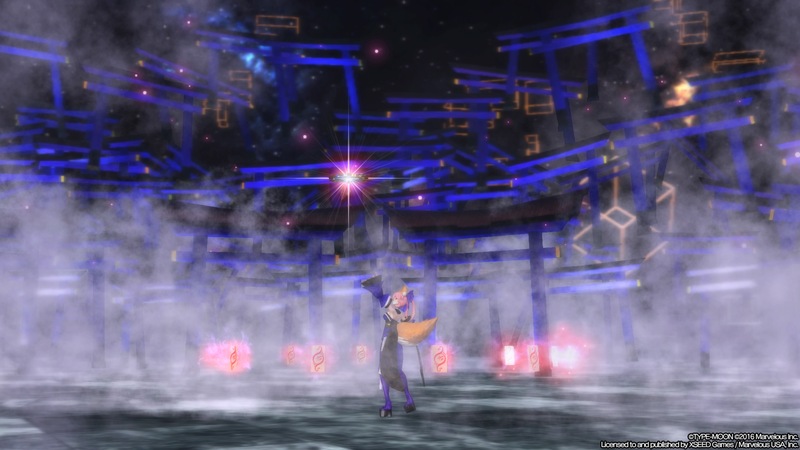 If the developers had taken the time to add more combat arenas and a wider range of objectives, Fate/Extella could have been something really special. As it stands, however, it's merely a decent game that suffers from its sheer lack of variety. Because of this, it's hard for me to recommend this game to anyone but the most ardent of Fate fanatics. The simple fact of the matter is that Fate/Extella is repetitive, even for its genre. There are plenty of vastly superior Musou-like games on the market right now, and I'd be far more inclined to recommend those ones over Fate/Extella if all you care about is cleaving your way through thousands of faceless enemy soldiers. For as much as I enjoyed Fate/Extella, I must admit that there simply isn't enough to keep most people interested in it. 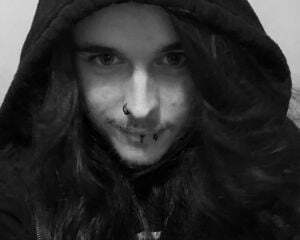 This is definitely one for the fans.